1. Most of our popular herbs originate in the Mediterranean, so they like sunny exposures, but most, with the notable exception of basil, will tolerate a moderate amount of shade, so as with greens that I mentioned in Day 19, they can be tucked into ornamental borders, or between tall plants, or grown in containers, or in devoted raised beds. Really, almost anywhere. 2. 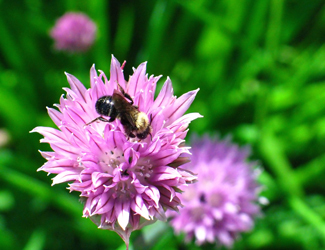 Many of the annual herbs will self-seed, dill and cilantro (the seed of which is coriander) being the commonest. Basil is annual, but doesn’t self seed in my garden–maybe because it never grows enough to actually make seeds. 3. 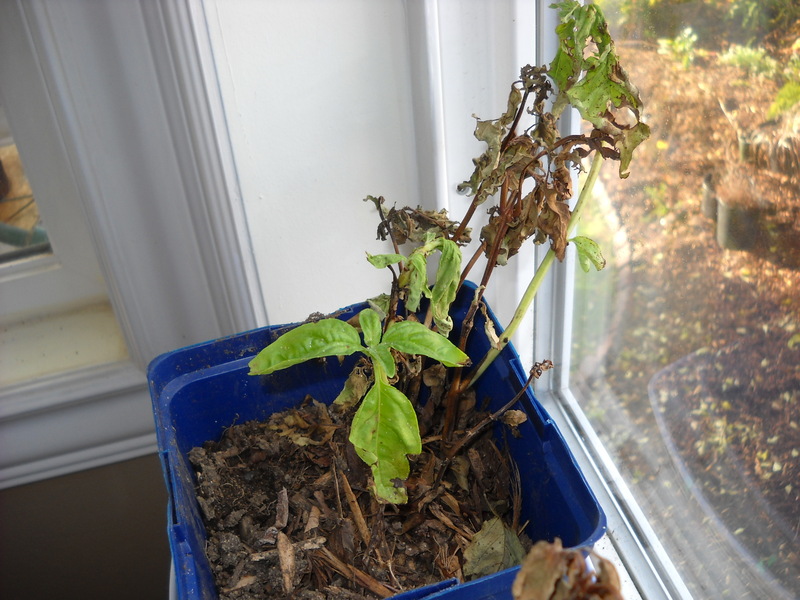 Basil deserves a note of its own: It loves heat and full sun (8 hours per day here in coastal BC), enough but not too much water, really good drainage, so containers or raised beds are suitable locations, constant harvesting, pinching out of new growth tips to stimulate more new growth tips. Don’t plant it out until the nights are consistently over 10 C. (Same rule as tomatoes.) It is said to be easy to grow, but I have failed more often than succeeded. 4. 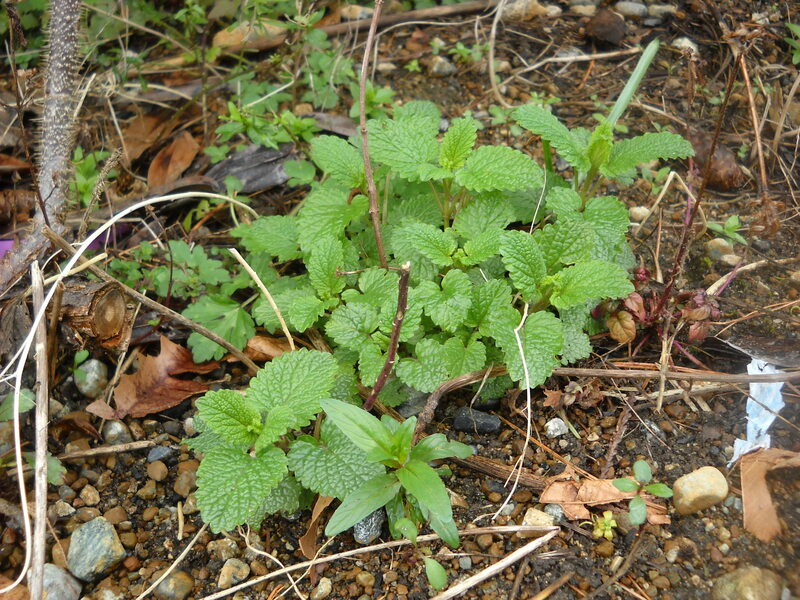 Mint also needs special care–plant it in seclusion! Either in a pot, or otherwise contained; all the mint family will spread like wildfire. 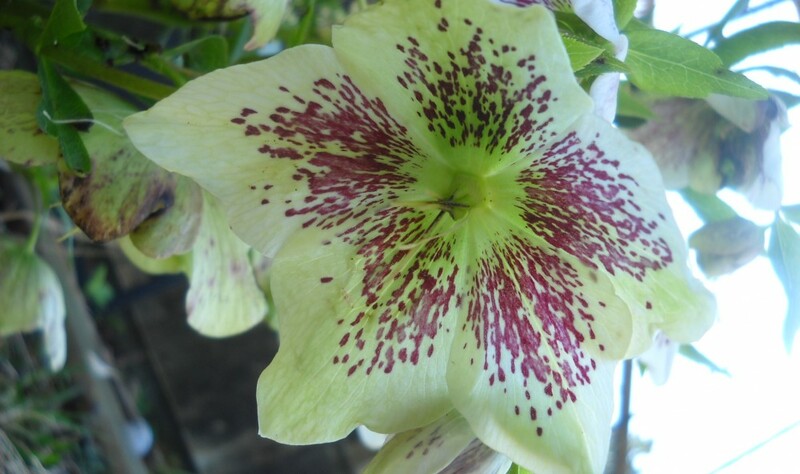 You can use a 2-gallon black plastic pot and cut the bottom off and plant it whole in the ground, But you’ll still need to catch flowers before they set seed, because the seed will scatter and you’ll be finding mint everywhere. But you might like that–most mints are attractive plants, not too big, and will help deter pests because of their strong fragrance. Lemon balm, of the Mint family. Planted by my tenant and now years after trying to remove it all, I’m still finding it in the garden. But pretty much limited to about 20-30 square feet. 5. Oregano, marjoram, thyme, sage are all easy to grow–even for me!– and hard to kill. Rosemary would also belong in that category except for our wet winters here. 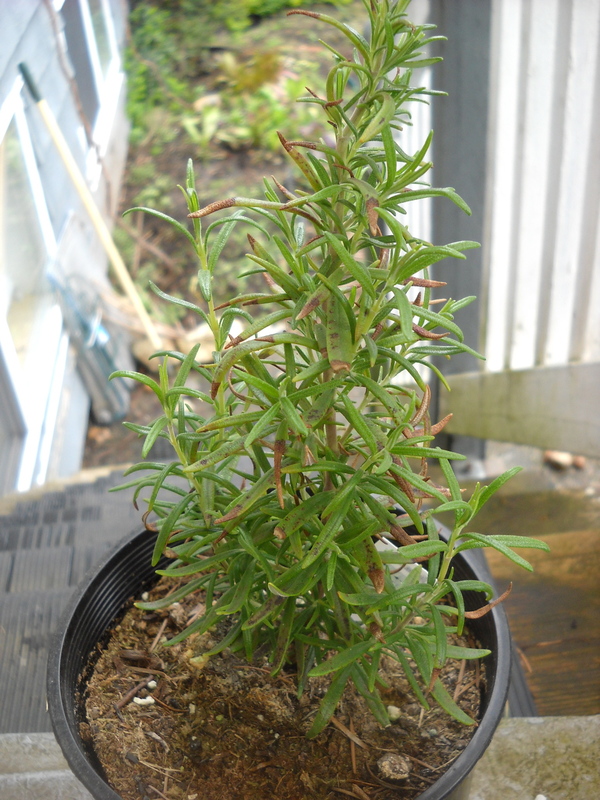 As long as they have a little shelter, and really good drainage, your rosemary will do well. 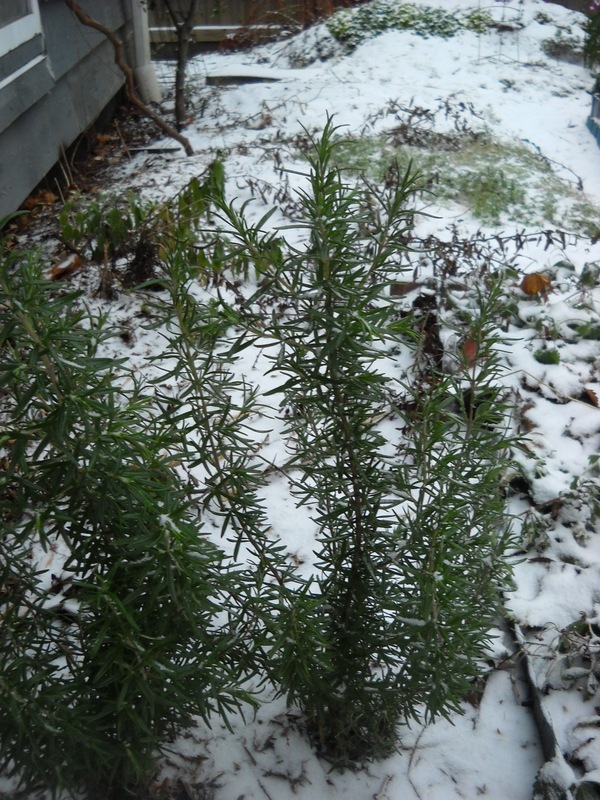 Last November’s 2 weeks of -10-12° weather was hard on the larger of my rosemary plants, but the smaller did just fine. One day left–tomorrow’s lesson is TOMATOES! A BIG disclaimer to start with: I live in coastal BC, Zone 7b to 8b (depending on your micro-climate). So we have a big advantage when it comes to herbs–most common herbs will survive, even thrive through our rainy but seldom frosty winters (today notwithstanding). This is not how you’d like your basil to look. So if you plan to salvage it from the garden I suggest you dig it up when it still looks big and bushy. Preferably I suggest buying a new one and keeping it inside. Rosmarinus officinalis is a Mediterranean herb that loves full hot dry sun, but will usually tolerate our cold wet cloudy winters if placed in a spot that won’t get too cold or too windy. Your best bet is to plant it on the sunny (south) side of the house/balcony, close to the wall. The warm building will provide some protection as well as reflecting the sun toward the plant. We’ve certainly had rosemary-killing frosts here in Metro Van, but they only happen every 5-10 years. And the older your rosemary is, the better it will tolerate the cold. Origanum vulgare, Thymus vulgaris, (I guess you have to know Latin to understand why one is a female herb and the other a male herb?–Latin scholars, please enlighten me here…), and Salvia officinalis, are also Mediterranean herbs that like the same conditions as Rosemary, but are much more cold-tolerant. Whether potted or ground-planted, very wintery and less-wintery winters, my oregano sage and thyme have weathered them all. 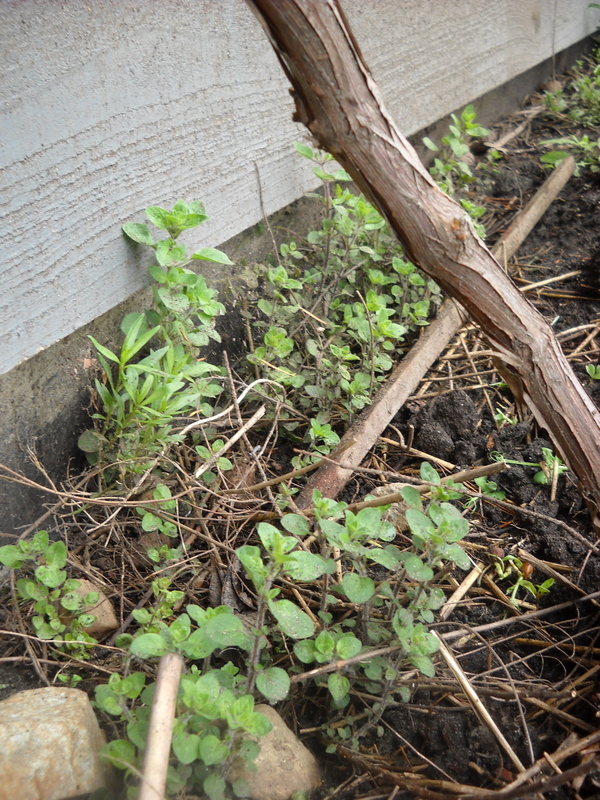 Oregano and thyme are what some call “thugs”–they self seed like crazy and are hard to kill. But they’re also easy to pull up if they’re in the wrong place, and don’t really crowd out their neighbours. Sage grows like a small shrub similar to rosemary or lavender. 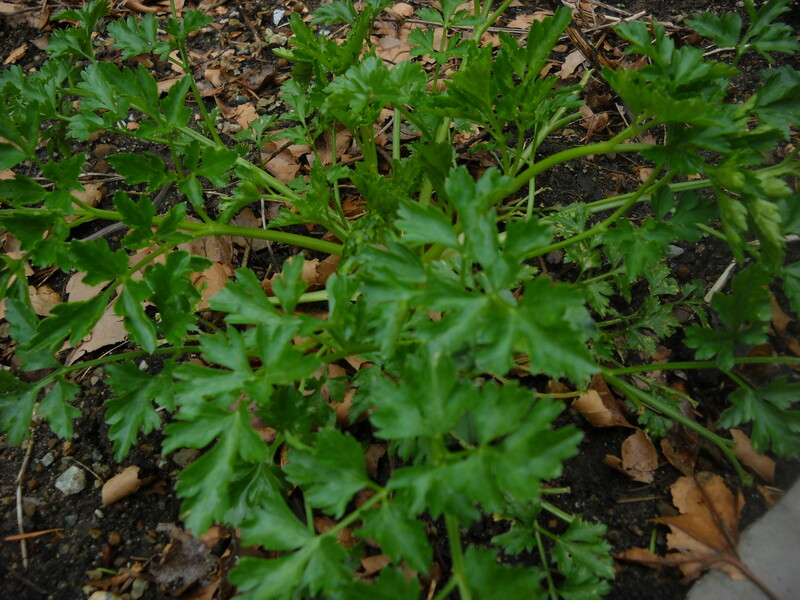 Petroselinum crispum is a biennial, which means it grows leaves its first year, and a flower stalk in its second year. After flowering and setting seed, the parent plant dies, but the following year the seeds that fell the previous year will germinate and lo!, another new parsley plant! Does very well in coastal BC. Grow your parsley room where it will have room to sprout new babies, and you’ll have a continuous supply of parsley, even through the winter. Don’t confuse Parsley with Cilantro, aka Chinese Parsley, which is an annual. It needs to be re-grown every year from seed, but self seeds very well. 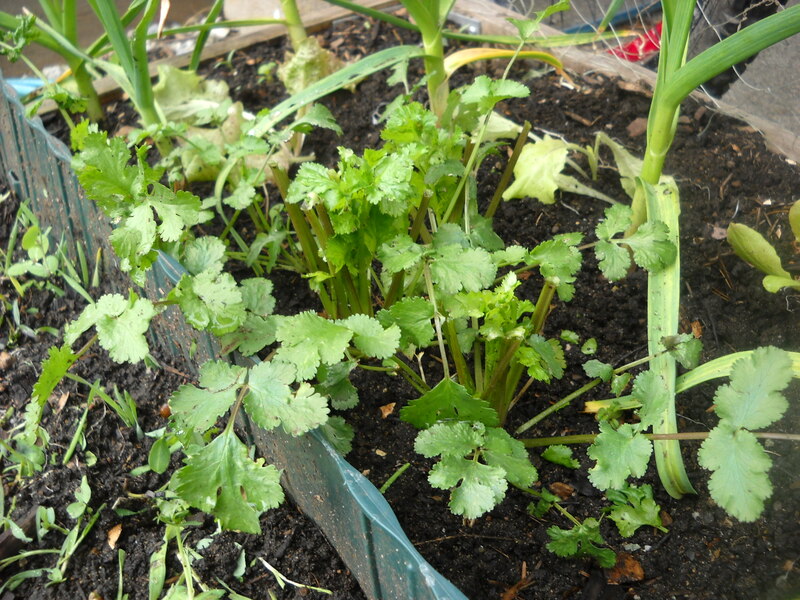 If you allow the flower heads to set seed and mature before you cut it down (or don’t–see my post about Fall clean-up), new cilantro will start to grow in mid spring. And if you collect seeds instead of just letting them fall, you can succession-sow them and have fresh garden cilantro right up until the hot days of summer start. Then start to sow them again and when it gets a little cooler, they’ll germinate and give you more harvests. There you have 5 winter-happy herbs and 1 winter-sad herb. Next year start early and you’ll discover the fun of harvesting your own herbs for cooking, teas, candies, whatever. Leave questions and comments. Oh, and all you Latin scholars, I really want to hear from you! Don’t forget to click on the Follow button.